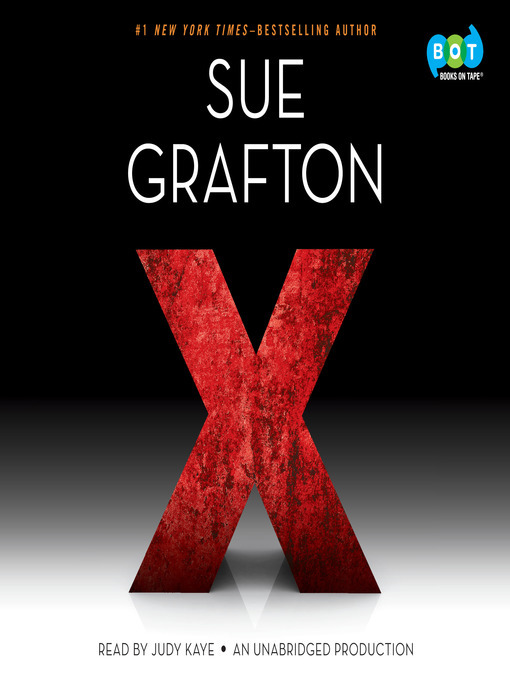 The item X, Sue Grafton, (electronic resource) represents a specific, individual, material embodiment of a distinct intellectual or artistic creation found in Topeka & Shawnee County Public Library. Of #1 New York Times&#8211;bestselling author Sue Grafton, NPR's Maureen Corrigan said, "Makes me wish there were more than 26 letters." With only two letters left, Grafton's many devoted readers will share that sentiment.X: The number ten. An unknown quantity. A mistake. A cross. A kiss.X: The shortest entry in Webster's Unabridged. Derived from Greek and Latin and commonly found in science, medicine, and religion. The most graphically dramatic letter. Notoriously tricky to pronounce: think xylophone.X: The twenty-fourth letter in the English alphabet.Sue Grafton's X: Perhaps her darkest and most chilling novel, it features a remorseless serial killer who leaves no trace of his crimes. Once again breaking the rules and establishing new paths, Grafton wastes little time identifying this sociopath. The test is whether Kinsey can prove her case against him before she becomes his next..